We have a small bit of medication that we give to our rabbits, Baxter and Quincy, on a daily basis. Two of the meds require refrigeration, but we throw all of them in the fridge just to be safe (and because it’s just easier vs. remembering). Last night, after I gave them their their medication… I promptly led them from the kitchen to their room (where they’re gated in). Genius that I am though, I forgot to put the medication back in the fridge, and it sat on our countertop throughout the night. Next morning, I discovered my mistake. Which was terrible – not only did Quincy miss some of the meds he needed in the AM, one of the bottles was a fairly sizable amount. All told, it was over $100 worth of medication, left out to spoil. So yeah, guessing I’m going to need to sell a lot of comic books to make up that difference. I took photos of the two bottles we needed to replace, and like an idiot… left them out on the countertop. Later, when I called the vet to get refills… the woman on the phone asked me how long they had been exposed. Turns out, you can leave the medication out once – up to about 8 hours. Beyond that, the stuff starts to break down. Had I simply put the meds back in the fridge, things would have been fine. Gah. Felt like losing $100 not once, but twice. So last night, after work, I ended up driving out to our vet in Skokie. Interestingly enough, it’s just down the street from Pita Inn, and a stupid grin breaks out on my face every time I pass by there. 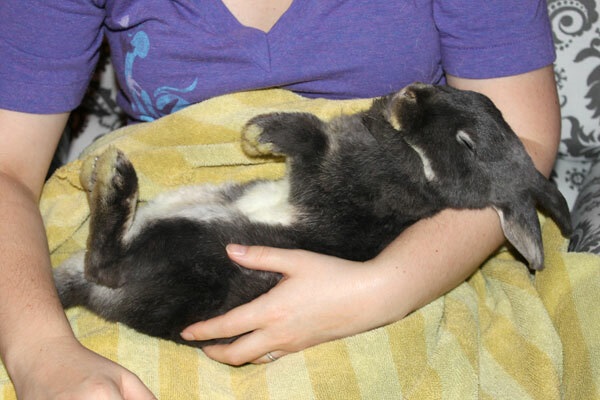 By the time I got home, Liz was sitting in the living room… giving the rabbits a bit of a nail trim. 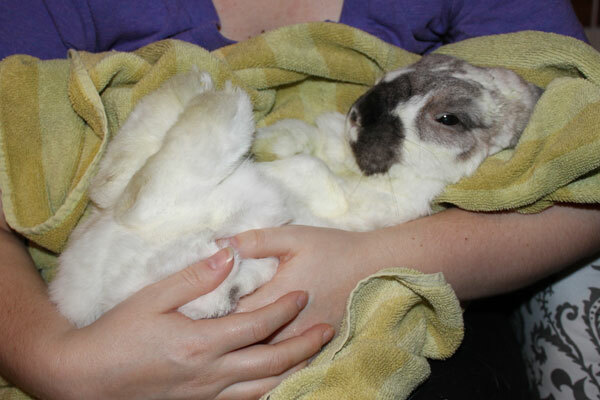 I was surprised to see the absence of a bunny burrito, and instead found each rabbit kind of reclined on her lap. They were fairly calm, though I’m not 100% if they’re simply dazed by being in this position. 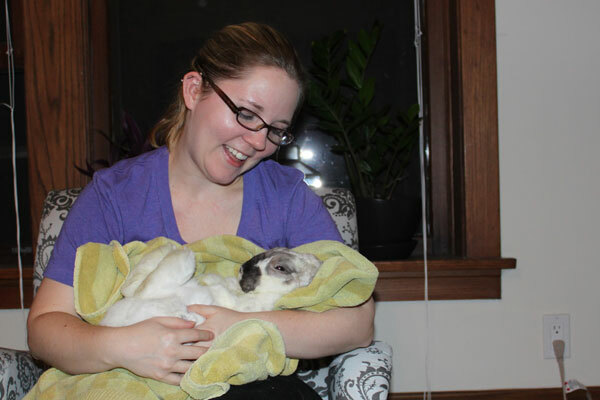 A few years ago, when Liz would trim Baxter’s nails and go through this whole process… Baxter held a grudge. For a few days afterwards, Baxter would keep her distance and would refuse to come near Liz. Today though, both bunnies were in fairly good spirits. Once their nails were done, things went back to normal pretty much immediately. Liz, with a reclined Baxter. Closeup shot. I can’t help but imagine Baxter jumping into a pool, doing a cannonball. We’re Going Someplace Called “Pita Inn?” In Skokie? Really?